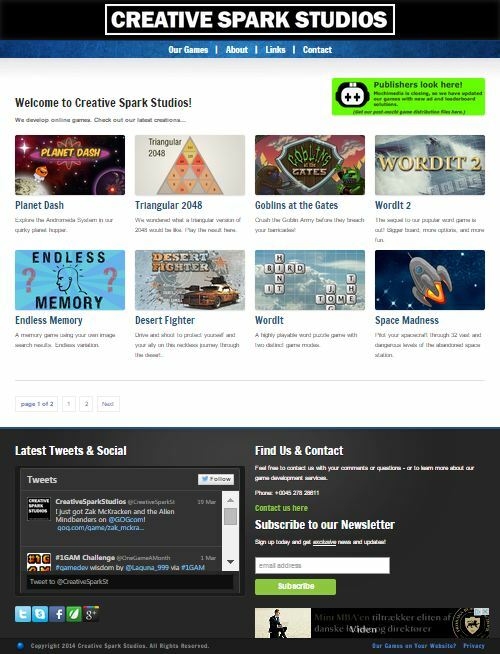 Most of my game development work has been done in the context of Creative Spark Studios, and building and maintaining the company website has always been a priority. The site has undergone numerous changes, and even included a WordPress game arcade at one point. The current design is a heavily customized version of a free HTML template by trendyWebStar, while the mobile page is based on a free responsive HTML5 template from HTML5Up. The next major redesign will probably include integrating the desktop and mobile versions in one responsive WordPress design.